Thank you Sweet Baby Ray’s for sponsoring this post! 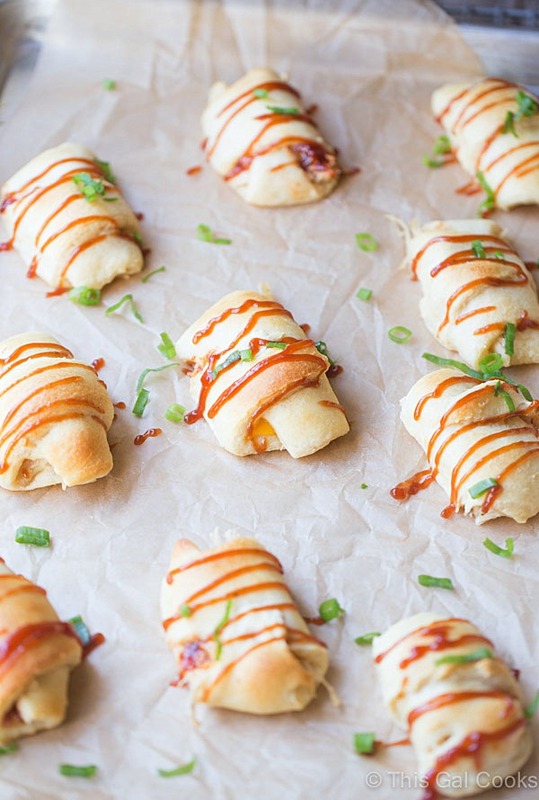 BBQ Chicken Crescent Roll Ups are a simple appetizer that’s ready to serve in under 30 minutes. Perfect for holiday parties, birthday parties and sports gatherings! You guys. Have you tried Sweet Baby Ray’s Vidalia Onion BBQ Sauce? Cause if you haven’t you need to get some NOW. 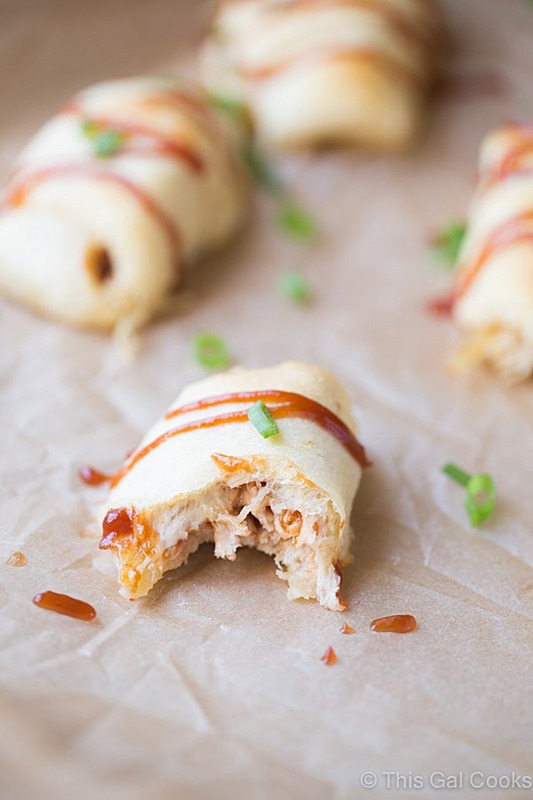 And then make these BBQ Chicken Crescent Roll Ups. I’ve teamed up with Sweet Baby Ray’s to create an easy to make appetizer that’s perfect for football season. 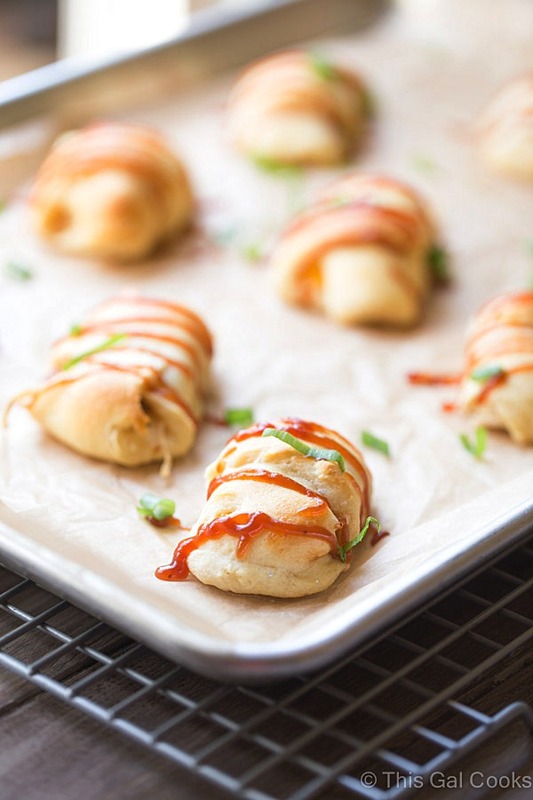 These BBQ Chicken Crescent Roll Ups are great for football parties or even for an afternoon spent plopped on the couch, watching the big game. Fact: I’m one of those gals who can make a meal out of appetizers. Sometimes I make them just because – no special event needed. But other times I go all out and make a ton of appetizers for Saturday evening college football, Sunday night football or for the big one, the Superbowl. No burgers. No pizza. Just loads of fun little bite sized appetizers. So back to my question. Have you ever tried any of the Sweet Baby Ray’s sauces? They are our go-to brand for BBQ sauces. We love the Original and Sweet & Spicy and now we love the Vidalia Onion, too! I made these BBQ Nachos and these Hot BBQ Pork Ranch Wraps with Sweet Baby Ray’s sauces. I made the BBQ Chicken Crescent Roll Ups that I’m sharing with you today with the Vidalia Onion BBQ Sauce. Today’s recipe is SO easy to make. I spent less than 30 minutes total on this recipe. Roll out the crescent roll dough. Top with chicken, BBQ sauce and cheese. Roll up. Bake. BOOM. Ready to devour! Roll out the crescent roll dough and cut at seams. You will have 16 triangles once you complete this. Cut each slice of cheese into 8 small rectangles. Top the large side of each triangle with 1 tbsp of shredded chicken, 1 tsp of BBQ sauce and 1 rectangle of cheese. From the large end (the end with the filling) fold in the sides and roll up. Be gentle so your filling does not ooze out. Place the rolls on the prepared baking sheet. Bake at 375 for 11-15 minutes or until golden. Drizzle each roll with more of the BBQ sauce, if desired. For drizzling: I always use a plastic sandwich bag. I fill the bag with the BBQ sauce, cut off a small piece of the corner and squeeze the sauce over the crescent roll ups. Please note: The green onions were only used for garnishment for the photos. They weren't a part of the recipe. 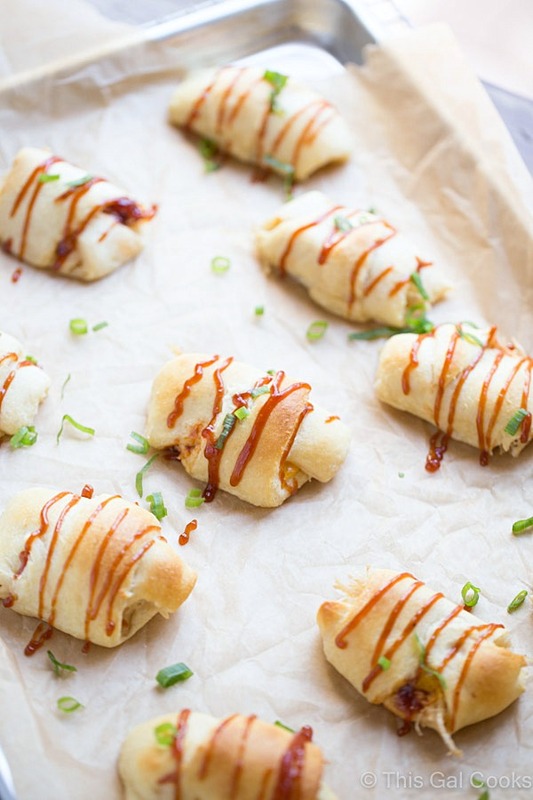 However, you can garnish your crescent rolls with green onions, if you choose to. If you do, the recipe will turn into a 5 ingredient recipe! For easy prep, use a rotisserie chicken. If you have any leftover chicken, try using it in these Buffalo Chicken Salad Cups or this Cranberry Pecan Chicken Salad. Wouldn’t it be awesome to win a years supply of Sweet Baby Ray’s BBQ Sauce? Heck yeah it would be. Enter Sweet Baby Ray’s Pass The Sauce contest for your chance to win a whole years supply of Sweet Baby Ray’s BBQ Sauce. Each participant is eligible to receive a $1 off coupon. Mmm. You’ll be dreaming about BBQ sauce now, won’t you? 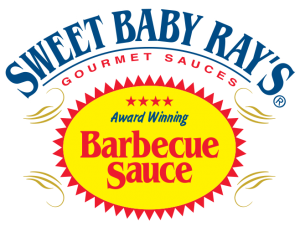 For more details about the Pass The Sauce contest, visit the Sweet Baby Ray’s Facebook page HERE. I was compensated for the product and creating this recipe, however, all opinions and recipes are my own. I love how quick and easy this is, Julie! :) Perfect for unexpected or last minute company… or even for game day. Love these! I like stuffing anything and everything in crescent rolls, but barbecue chicken? Brilliant! Thanks, Karly! I’m becoming a fan of stuffing things into crescent rolls. MUST make more crescent roll recipes now. Wow, only 4 ingredients! I love simple recipes like this that do not require.. a lot of ingredients. Appetizers I can pop in my mouth one after the other after the other after the other are of course my favorite. Less mess, more food! :) Yum! I could easily turn this into an awesome dinner with a veggie side. Thanks got sharing because I’m pinning. Yes, you could totally do that! Thank you for stopping by and for the pin too, Leslie! I actually have not tried Sweet Baby Ray’s sauce yet and now I know I am missing out. Will fix that for sure. Love these appetizers!! Oh you need to pick some up so you can try it! It’s our favorite sauce! Thanks for stopping by, Zainab! Absolutely love these Julie, so easy to make too! These look delicious! Right up my alley – yum! I thought you would like these, Claire! Thanks for stopping by. Hope you have a great weekend! Winner, winner! I can’t go back to my old sauce after trying SBR’s! So good, isn’t it?! Thanks for stopping by, Paula! I love this, I can’t wait to try it! Hope you enjoy them! Thanks for stopping by, Amanda! 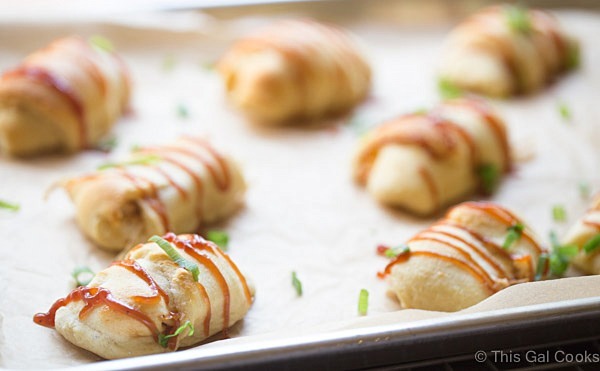 We use Sweet Baby Ray’s sauce – love it and these roll-ups are perfect appetizers! These are the perfect little bites. Love how easy they are to whip up! We use Sweet Baby Ray’s too so can’t wait to try this recipe! These look great Julie! We love Sweet Baby Rays, but I have never tried the Vidalia Onion kind. I need to try that and these crescents. This was our first time trying the Vidalia onion. So glad we tried it because it is SO good! CHEESE! Gimme all of the cheese. You’re so right – cheese stuff anything is the stuff to be all over! These are perfect for unexpected guests. Just the other day I made a version of these. Awesome! I bet your version was good! I do a different version of these but i think i like this better! thanks! Wow! I would love to have these today as I am hungry for not taking my breakfast. :D Thanks for sharing! Yummy finger food. Thanks for sharing at the #InspirationSpotlight Party @DearCreatives Pinned & shared. What a delicious and easy appetizer idea! Plus, BBQ is always a great idea! Thanks for sharing your recipe with us at Merry Monday this week. These look perfect for when a guest comes unannounced since most people already have these ingredients in the kitchen! Just a reminder, don’t forget to add links to this week’s Fiesta Friday post, as well as Petra’s blog and my blog so you can be considered for features next week!? Thanks for sharing! Happy Fiesta Friday!!? Thanks so much for sharing the awesome BBQ Chicken Crescent Roll Ups with us at Full Plate Thursday!